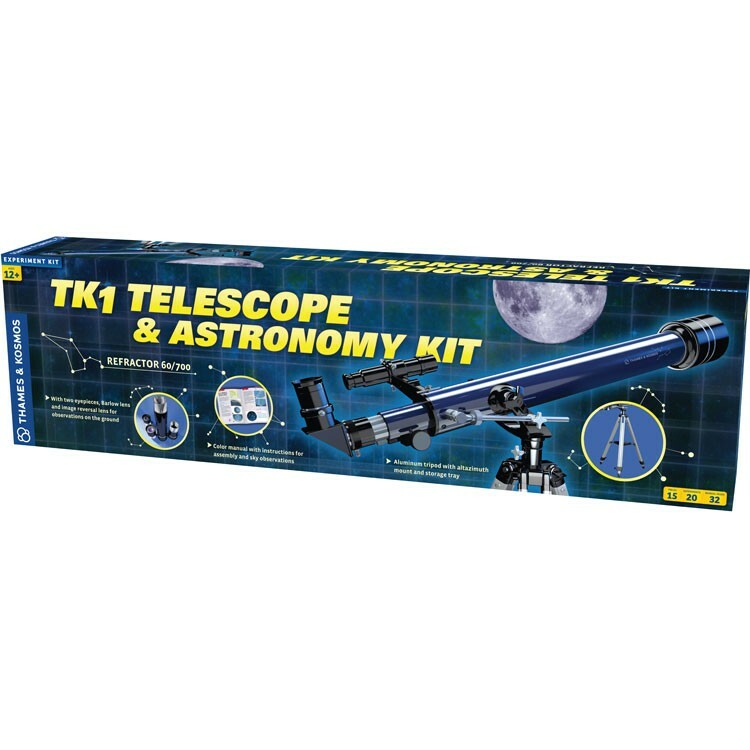 Entry-level and advanced amateur astronomers will excited to explore and learn with this terrific children telescope set from Thames & Kosmos. 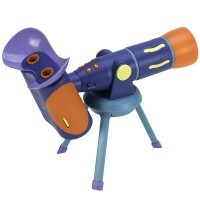 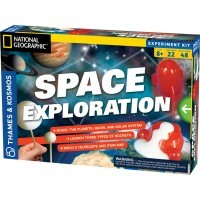 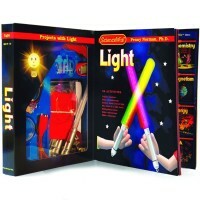 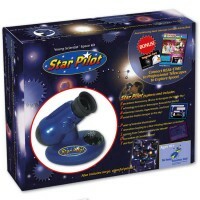 Discover the stars and become an astronomer or look across the horizon with the TK1 Telescope & Astronomy Science Kit. 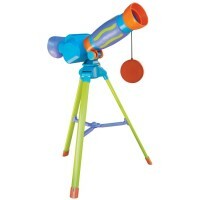 This great telescope set by the multiple award winning German toy maker, Thames & Kosmos, is a great way for beginner scientists to reach for the stars. 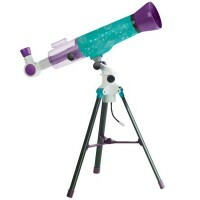 This kids astronomy kit from Educational Toys planet features a high quality 60/700 refractor telescope with coated glass optics and total magnification power 35x, 70x and 140x. 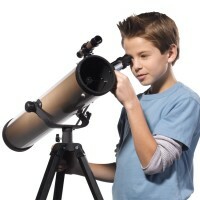 The enclosed 32-page science guide and plenty of astronomy learning tools and accessories let the children become excited about space observations. 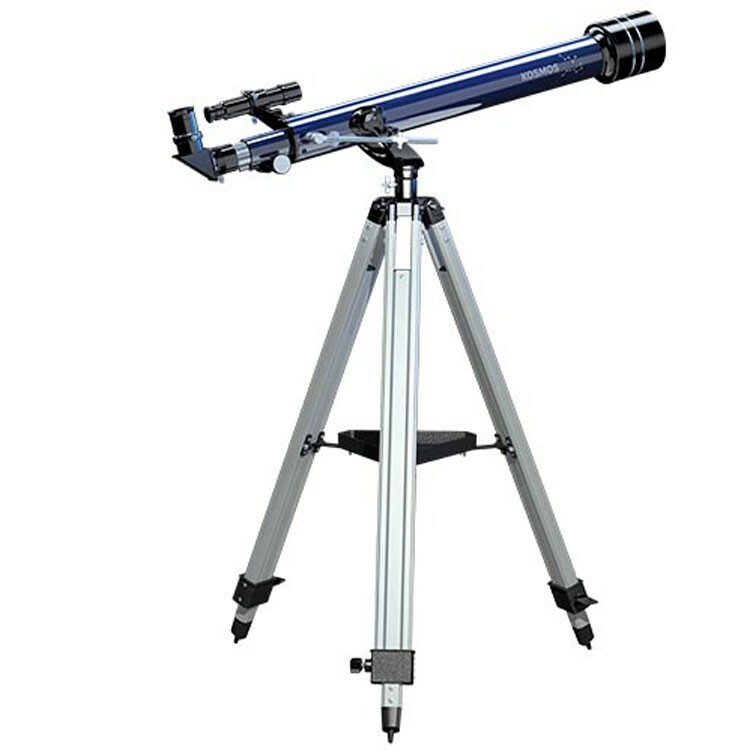 With the tripod standing telescope young stargazers can see crater Moon surface, Mercury Mars, Venus, Jupiter and Saturn with their stripes and moons, Uranus, various constellations, nebula and galaxies. 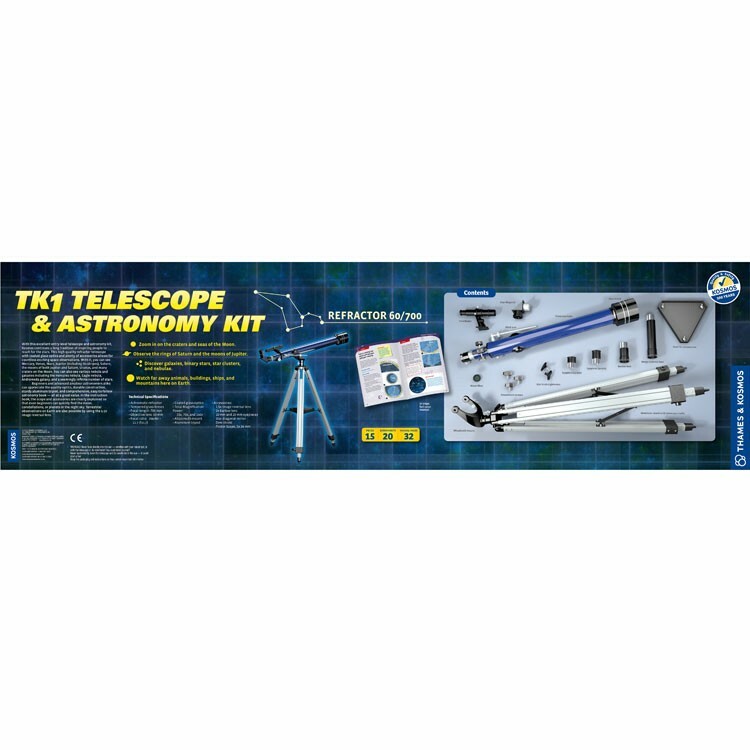 TK1 Telescope & Astronomy Science Kit features quality optics, sturdy construction, stable aluminum tripod, and telescope accessories: 1.5x erecting lens for terrestrial observation, 2x Barlow lens that double the magnification power, 10 mm and 20 mm eyepieces, diagonal mirror that allows viewing at easier angles, dew shield to protect the nex, and 5x 24mm finder scope that helps to find objects easier. 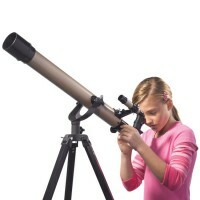 Entry-level and advanced amateur astronomers will excited to explore and learn with this terrific children telescope set. 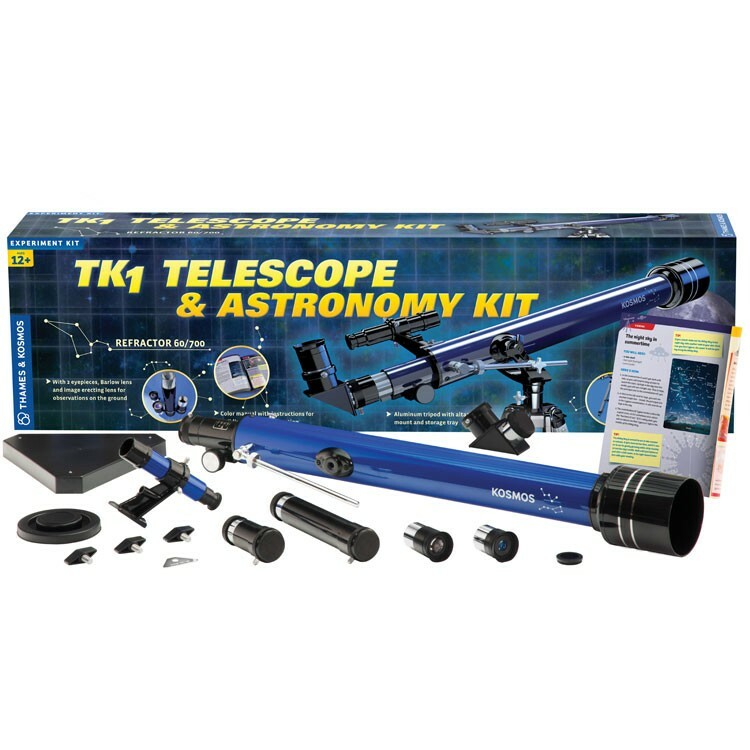 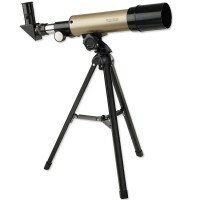 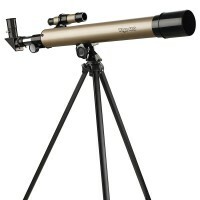 Dimensions of package 10.2" x 32" x 5.1"
Write your own review of TK1 Telescope & Astronomy Science Kit.